The importance of water can never be limited to home use only. You’ll really need it daily for the number of days you will be on the road trip in your RV as well. Under such cases, the use of water bottles becomes so expensive and inefficient. You, therefore, need the best RV water pump to keep your recreational vehicle having a constant full supply of water. You need to keep yourself hydrated, freshened up and clean. Water will be very necessary to realize all these while camping in the wilderness in your RV. A good number of RV’s come with already operational water pumps, but there are times that you will have to replace them to meet your water needs. There is also the possibility of the RV water pump breaking down and this is where you might need another better replacement. It is, therefore, very necessary to have some information about these water pumps and how you can make an informed opinion if any of these cases arise. In this article, we’ve carefully selected the best 4 products that can fit in your budget given any kind of situation you might find yourself in. We’ve even gone further to give you what you need to look at before making any purchase. Have a look. Buying an RV water pump isn’t an easy thing. The limitless number of pumps available complicates the search just like in the case of the RV sewer hoses. Being that we are so concerned about the time you waste looking for these products, we’ve settled on the best four that we believe can help solve your problems. None of the RV water pumps beats the SHURFLO 4008-101-E65 in terms of performance. It is a very robust and reliable replacement you can consider having for your RV. Its standout features revolve around the one-piece diaphragm as well as internal by-pass. These are what make this pump capable of operating for an extended period of time. 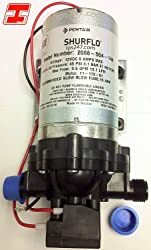 This pump has the abilities to supply water at the rate of 3 gallons per minute (GPM) to the onboard sinks, toilets and the RV shower head among others. Can you imagine that a mere power draw of 7.5 amps from the 12V-volt RV deep cycle battery is what is required for the supply? 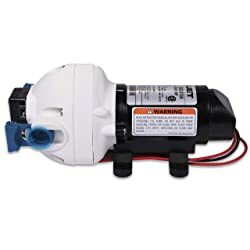 The other thing that you will like about this water pump is that you can have it mounted anywhere, is protected against unfavorable temperatures and is capable of running dry without being damaged. Additionally, this pump operates under reduced vibrations, pump cycling and noise levels as a result of its Flow Reaction Technology. These qualities are all packaged under a relatively affordable product like this one. It can be widely used in areas like trailers, fifth wheelers, and motorhomes. This pump can deliver water at a pressure of 55 pounds per square inch (PSI). This pump is self-priming and this will only make your work even simpler. It also has a built-in check valve to help control the flow of water. The pump has approximate dimensions of 4.9 by 8.1 by 4.3 inches. Additionally, it weights about 5 pounds. What’s more, it is backed up by a warranty of two years which is free from artistry and material defects. The cheaper version of our top pick is the Flojet 03526-144A RV water pump. It is also a self-priming water pump that is capable of suctioning lift up to 9 feet. What makes it a perfect alternative is its ability to run smoothly even without an accumulator tank. The presence of a pulsation eliminator makes the pump capable of operating smoothly without the accumulator tank. Another thing you will notice with this pump is its soft but noise-absorbing mount. So whenever the pump is running, there are minimized chances of vibrations and annoying noise. This pump can safely run even in a dry state. One other feature that you will surely like is how easy it is to hook up. You can even make it not to cycle every single night. Its installation is a breeze as well due to the available connectors and port fittings that make it quick to snap. The materials from which it has been made are good in resisting corrosion. It will, therefore, last longer with very minimal maintenance. To minimize on pulsation, the pump already has a built-in bypass. Additionally, it has an enclosed ball bearing as well as a permanent magnet motor. Its pressure switch setting is at 3.4 bars. This product is a 12-volt type with a weight of 4 pounds and dimensions of approximately 4 by 9 by 4 inches. What’s more, this pump is capable of supplying water at the rate of 2.9 gallons per minute (GPM) at a pressure of 50 PSI. This is the most pocket-friendly RV water pump you can probably find on the market. Don’t be mistaken to think that the low price is as a result of compromised features; not at all. The Seaflo RV water pump is very compact and has been designed to perform a wide variety of tasks such as spraying, filtration, circulation and of course liquid transfer. This 21-series pump is self-priming and, therefore, you won’t worry about issues to do with priming this RV water pump. It can also run dry without any damages. It is also capable of delivering water at a rate of 1.2 GPM at a pressure of 35 PSI. In fact, it has a built-in pressure switch that automatically switches it on and off. Due to its self-priming feature, it can be mounted above your water tank. Besides, it has a built-in thermal protector. It weighs 1.5 pounds with dimensional measurements of approximately 6.5 by 3.8 by 2.5 inches. Its operation is quite convenient as little noise and vibrations can be experienced in the process. It consumes less power during the process of pumping the water. Its installation process is also less demanding. The other good thing is that this is a very versatile pump which can be used in a number of applications besides the RV. Considerably expensive products are always better performers. Besides, they are very durable. This is where the SHURFLO 2088-554-144 RV pump comes in. It is actually what you’ll need for the transfer and dispense-on demand applications. It is a very reliable RV water pump when used in the high flow and moderate pressure applications. This pump is conveniently designed and lightweight making it easy to mount in any given position; be it vertical or horizontal. The design itself makes it very easy to maintain one of these pumps. The pump has NSF certification which makes its water safe for bathing, drinking and preparing foods. 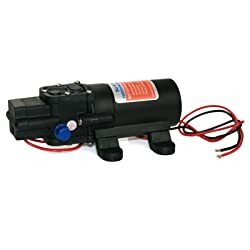 This pump makes use of polypropylene materials which make water stay safe for consumption regardless of the materials it gets into contact with. It has a permanent magnet motor that operates it and is also thermally protected. This 12-volt RV water pump is capable of delivering water to your RV at a rate of 3.5 GPM and pressure of 45 PSI. It is a 3 chamber diaphragm pump that has a check valve to prevent reverse flow. What’s more, this pump weighs 4.85 pounds with package dimensions of approximately 8.8 by 5.6 by 4.5 inches. It is important to know the type of water pump that your recreational vehicle needs before you even think of making a purchase. This is what we want to look at in this section. This is the most common type of RV water pump. These are standard operating motors specifically designed for use in RV’s. The pressure delivery of such pumps is always lower than the big water pumps, but just sufficient for use in an RV. When using this type of water pump in your RV, rest assured that there will be no alarming increase in water and electricity bills. This type has a higher water pressure compared to the 12-volt type. They are the types that are mostly found in trucks and buses. For high flow and reliable performances, most people always prefer this type of RV water pump. Regardless of the type of water pump you choose, regular maintenance is essential for the proper operation of the pump. This will also in a way help in extending the lifespan of the pump. The 24-volt pumps consume more power. Therefore, there will be a considerable increase in water and electricity bills if used even for lighter tasks. Just like it is sometimes necessary to quiet a generator while camping, some RV water pumps need the same treatment. This is because some RV water pumps are very noisy. You won’t really feel the effect during the day but wait till darkness sets in and you want to have a peaceful night rest; the noisy little pump won’t let you have it. Well, there are some brands that sell kits that help in reducing the noise separately. Attach the male ½’’ pipe thread having a hose barb to the distribution connector. This ensures that water will be able to flow to every part of the RV once you are done. Make sure there is a loop or coil connecting the tubing during attachment to disperse any vibration as the pump runs. To complete the connection of the tubing to the entire system, attach the female ½’’ pipe thread with an adapter to the water pump directly. Secure both ends of the connections to the tubing using the hose clamps. Use the Teflon tape to finish off the process. Threaded fittings shouldn’t be over-tightened during the process. As long as that is done, you’ll notice a significant reduction in the noise produced. The best RV water pump should be quick and easy to install. It should be something that you can actually do on your own. You also need to make sure that the dimensions are similar to whatever you are replacing. Nothing consumes time like trying to fit a pump in a space not meant for it. The compact and small-sized water pumps are the easiest to install. Such small pumps have very few usable components that won’t even consume much of your time. Again, the compact pumps are lightweight and hence easy to transport to the installation location with ease. But again you need to have materials like a screwdriver, Teflon tape, and water hose to help you in the installation process. Due to the fact that motors are incorporated in RV water pumps, expect to hear some noise during the operation process. The level of the noise is what you actually need to check on. The best pump shouldn’t be producing much noise even if a good number of faucets are opened simultaneously. The 5-chamber designs are the best when it comes to minimizing the noise produced. The type of mounting is also important whenever you are choosing the best RV water pump based on the noise produced. There are some that come with noise-absorbing systems of mountings; such are notable prompters of quiet operations. There are also pumps whose motors will be so jerky during operation. They are the ones that produce irregular water flows with too much noise accompanying the process. You also need to research on the manufacturer’s background as there are some who just deal in the production of quiet water pumps. You can as well choose to seal off your pump area with some cover because doing so will minimize the noise produced. The cover can also protect the pump from other foreign elements like falling debris. Note that the cover should be made in such a way that it doesn’t cause the motor to overheat. Most people normally mistake bigger pumps to mean they are more powerful and hence better; that isn’t anywhere close to the truth of the matter. There are smaller pumps that are much more effective than the bigger models. But again, in as much as power is essential for the operation of a water pump, RV water pumps don’t need to be so powerful. The less power the pump can draw, the more you are likely to save on water and energy bills. You can also minimize the times when the pump will be drawing power to save energy. Even if it draws little power, there is still need to minimize on any possible wastage. What is the amount of water needed for this pump to operate efficiently? If you have to pump less water efficiently, you’ll have to look for a pump that with a little lift. This is another consideration you have to make based on where you will drain the water from. Before you make any purchase, always make sure you know the amount of water that you are likely to use. That is the only way you will be able to gauge whether the amount of water that the pump will be delivering in gallons per minute (GPM) or PSI will meet your needs. As you have noticed from our products above, the RV water pumps are available in different prizes. One thing you seriously need to take note of is whether the pump’s features and quality are in line with the price. You’d rather make a cheaper mistake. Water is very important to every living organism. However, it is even of much importance to any person on a road trip. Without a water pump, you won’t have reliable access to this most important commodity. 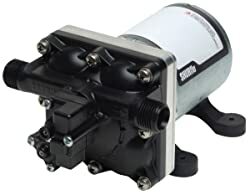 SHURFLO 4008-101-E65 is the best RV water pump you can ever come across. It operates quietly and is thermally protected as well. In addition, its water supply at a pressure of 55 PSI and a rate of 3 GPM makes it ideal for use in an RV. It is self-priming, has a check valve and has a warranty of two years placed on it. These are just but a few of the many benefits of having this pump as part of your RV. You can as well try out the other three RV water pumps as they are equally good. This guide will help you make an informed opinion in a very minimal time. Don’t make an expensive mistake yet this guide has basically everything you need to know concerning RV water pumps.